Mit 15 Jahren fasste ich den Entschluss, mich dem Lernen zu widmen. Mit 30 Jahren stand ich fest auf dem Boden. Mit 40 Jahren ließ ich mich nicht mehr von meinem Ziel abbringen. Mit 50 Jahren erfuhr ich den Willen des Himmels. Mit 60 Jahren schenkte ich den Geboten des Himmels ein gelehriges Ohr. denn meine Absichten durchkreuzten nicht mehr den Willen des Himmels. Im Bürgersteig ein tiefes Loch. Ich bin am Ende. [...] Ich bin hilflos. Es dauert ewig, hier wieder herauszukommen. Ich tue, als sähe ich es nicht. Ich kann nicht glauben, dass ich wieder drin stecke. Und wieder dauert es lange, bis ich herauskomme. Und ich falle wieder hinein. […] Es ist schon Gewohnheit. Ich kann sehr wohl etwas dafür. Da das menschliche Gehirn […] nicht wie ein Feststoff-Computer, sondern wie ein elektrisch-kolloidaler Computer arbeitet, folgt es auch den gleichen Gesetzen wie andere tierische Gehirne. Das heißt, die Programme gelangen […] als elektrisch-chemische Verbindungen ins Gehirn. 1. Prägungen Dies sind mehr oder weniger eingeschweißte Programme, die das Gehirn von seiner Anlage her nur in bestimmten Stadien seiner Entwicklung verarbeiten kann. Diese Stadien werden in der Ethologie als Zeiten besonderer Prägungs-Empfindlichkeit bezeichnet. 2. Konditionierungen Diese Programme bauen sich auf den Prägungen auf. Sie sitzen loser und lassen sich mit Hilfe von Gegen-Konditionierungen ziemlich leicht verändern. 3. Lernen Dies ist noch lockerer und durchlässiger als die Konditionierungen. bot er eine Pallette von neun verschiedenen Intelligenzen an. [*] Sieben Intelligenztypen – Eröffnung der Diskussion zu "multiplen Intelligenzen"
Bewusstsein "Vertreibung aus dem Paradies"
Milch habe ich euch zu trinken gegeben, und nicht Speise; denn ihr konntet noch nicht. Anfänger-Geist ist unser ursprünglicher Geist, ein wirklich leerer und unvollkommener Geist. Wenn unser Geist leer ist, ist er für alles bereit, ist er für alles offen. Im Anfänger-Geist liegen viele Möglichkeiten, in dem des Experten wenige. Galieo Galilei wurde 1992 von der Katholischen Kirche rehabilitiert. 1. Systeme organisieren können im optimierenden Sinne. 2. Er muss Menschen coachen können im Sinne der Teamführung. 3. Er sollte in der Lage sein, Menschen zu faszinieren im Sinne der gemeinsamen Sinnstiftung. 4. Und er sollte in der Lage sein, die Vernetzung zwischen Menschen zu fördern im Sinne einer übersummativen Intelligenz. Dann können wir optimieren, genauso gut wie Prozessmuster wechseln. Dann haben wir die reife Balance zwischen Assimilation und Akkumulation. [...] Die erwachsenen Lernwege sind immer eine Balance zwischen Stabilität und Instabilität. So preserve yourselves, my brothers, from the calamities of this place, for distinguishing it is extremely difficult! Souls find it sweet, and then within it they are duped, since they become completely enamored of it. If you educate a boy, he will have a good life. At 15, I set my heart on learning. At 30, I had planted my feet firmly on the ground. At 40, I was never led astray from my goal. At 50, I knew the will of heaven. At 60, I heard the bidding of heaven with a docile ear. At 70, I could do as my heart pleased, for what I desired no longer conflicted with the will of heaven. Johnny couldn't read and a previously unrecognized affliction called dyslexia (nonexistent in ideographic China) broke out at alarming rates in classrooms all across Eurocentric television land. Dyslexic children, predominantly male (9:1), have difficulty deciphering the alphabet. One credible theory proposes that it is due to a failure of hemispheric dominance. Ninety percent of the language centers traditionally reside in the left hemisphere of right-handed people. In the right-handed dyslexic, the distribution of language centers may be more on the order of 80/20 or 70/30. Although we cannot be sure that dyslexia was not always among us, it seems to have erupted at the very moment that an entire generation was devaluing the left hemispheric mode of knowing. Perhaps television is the agent equilibrating the human brain's two differing modes of perception. Learning is a life long process in which an individual acquires information that causes maturity and purpose. This process often leads people to operate as functional individuals in our society. Information acquired in the learning process can come from a variety of situations such as formal education and life experiences. The multiplicity of experiences in my life has surely helped me to mature. Learning is multidimensional. It is intellectual and what I call heart smart. On one part, there is the mental stimulation that is gained through learning and assessed through many forms of written and performance-based tests. However, one cannot focus primarily on the intellectual. Learning must also be achieved in the areas that affect the choices and empathic intelligence of a person, leaving him or her empowered to make a difference in their lives and in the lives of others. There is also a difference between acquiring information and being able to understand and apply the information that has been learned. In attempts to understand myself as a learner, I discovered that learning is complex and involves motivation, inquiry, research and reflecting. From dissolution new formerly impossible solutions may arise. Future classrooms are virtual networking. Ongoing learning – is one of the few proven ways to reduce chances of dementia and add years to life expectancy, e.g, people with a Ph.D. live about 2 years longer than those with a Bachelor's Degree. Talking to oneself helps – backed up by science. 1. The human brain works more efficiently. 3. It helps to organize one's thoughts. 4. It helps to achieve more goals. Don't look and don't copy because that's cheating. 1. Diversity Human beings are naturally different and diverse. Education under "No Child Left Behind" is not based on diversity, but on conformity. 2. Curiosity Curiosity is the engine of achievement. Children are natural learners. Teaching is a creative profession. 3. Creativity The human life is inherently creative. The real role of leadership in education is control of climate, creating a climate of possiblity. In the twenty-first century context has become more important and content. And I think that needs to shape our move forward. In the classroom we need to reevaluate both the notion of expertise of the teacher and the role of the student. If our goal is to get information from the professor's head, the teacher's head, into the student's head and test how efficiently that's transferred I think that that's a game we're gonna loose, and very quickly. If we can teach them how to understand and master context, I think or onto something. Google has all of the content they're ever going to need. They'll never get through it all. But it takes a teacher to shape that context for that content to have meaning. And I think our role as teachers has to change, from delivering content to mastering context. That's the first thing. The second thing is we've really need to pay attention to that notion of imagination. We need to think of our students as being able to see the world in interesting ways. We need to encourage that. We need to understand that that's were innovation comes from. All learning, real learning, takes seven years. It takes seven years to change approximately all of the cells in the body. We live in a seven year cycle. those who can't teach teach teachers. Reason and learning are like body and soul. Without the body, the soul is nothing but empty wind. Without the soul, the body is but a senseless frame. Question: Resolution of most conflict, then, is possible by education? Acceptance of inevitable human error is more beneficial than denunciation. he presented nine types of intelligence. [*] Seven Intelligence types – Opening the discussion on "multiple intelligences"
When all steps in the learning cycle are working well in an emotionally supportive environment, the result is continuous active learning. Whenever any of these steps is inhibited, active learning is not happening. 1. Unconscious incompetence The individual does not understand or know how to do something and does not necessarily recognize the deficit. They may deny the usefulness of the skill. The individual must recognize their own incompetence, and the value of the new skill, before moving on to the next stage. The length of time an individual spends in this stage depends on the strength of the stimulus to learn. 2. Conscious incompetence Though the individual does not understand or know how to do something, he or she does recognize the deficit, as well as the value of a new skill in addressing the deficit. The making of mistakes can be integral to the learning process at this stage. 3. Conscious competence The individual understands or knows how to do something. However, demonstrating the skill or knowledge requires concentration. It may be broken down into steps, and there is heavy conscious involvement in executing the new skill. 4. Unconscious competence The individual has had so much practice with a skill that it has become "second nature" and can be performed easily. As a result, the skill can be performed while executing another task. The individual may be able to teach it to others, depending upon how and when it was learned. 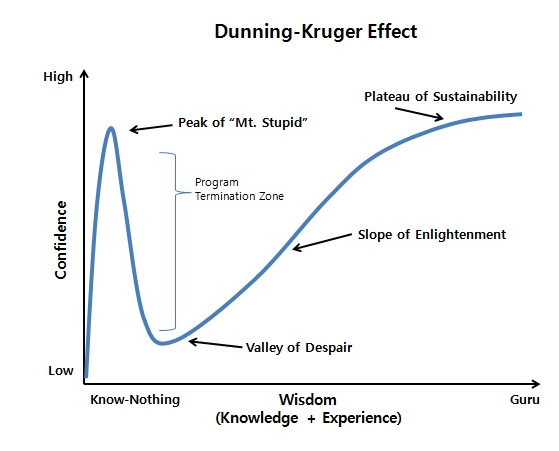 Dunning–Kruger effect = Self-awareness deficit of incompetents = Lack of "knowing thyself"
[Paraphrased summary] Incompetent ignorant Westerners (not Easterners or Resteners) cannot know they're incompetent or deny their lack of skill, experience and knowledge (incompetence). Much incorrect self-assessment of competence of Americans is due to the ignorance of the standards of performance of an activity (such as reading comprehension, motor-vehicle operation, playing chess or tennis, practice of medicine). ➤ recognize and acknowledge their lack of skill only after being exposed to formal training in that skill. ➤ The skills needed to produce a solution coincide with the skills needed to recognize what a right answer is. Subject I walk down the street. I walk down the same street. I walk down the same street. I walk down the same street. I walk down a DIFFERENT street. Object There is a deep hole in the sidewalk. There is a deep hole in the sidewalk. There is a deep hole in the sidewalk. There is a deep hole in the sidewalk. ./. Denial ./. I pretend I don't see it. I see it is there. ./. ./. Subject ⚠ Object I fall in. I fall in again. I still fall in – it's a habit. ./. ./. Victim stance / Learning I am lost – I am helpless. I can't believe I'm in the same place. My eyes are open. I know where I am. ./. ./. Responsibility It isn't my fault. But it isn't my fault. It is MY RESPONSIBILITY. ./. ./. Solution It takes forever to find a way out. It still takes a long time to get out. I get out immediately. I walk around it. ./. NOTE: This poem is used in numerous 12-step substance-abuse programs. When the US American business man, scientist, inventor of electricity Thomas Edison was seven years old he left school after his teacher told his mother that, as a student, Edison was dull, confused and couldn't learn. During the eighty-four years of his life, he patented 1,093 inventions! The parents of the later genius Albert Einstein's were worried because he was so slow to learn to speak. During his early school years, he did not excel and hated having to attend classes regularly and take the prerequisite exams. Störungen versus Wertemuster als Kooperationsbasis, Erzeugung mentaler Welten. Eine gemeinsame Kultur ist die notwendige Grundlage eines erfolgreichen Lernprozesses in Unternehmen. "Corporate Learning erfordert eine Professionalisierung von Lernstrukturen, die normalerweise von allein passieren." Trial and error, Ausblenden, Trivialisieren, Rationale Reduktion, Basis der Intuition, Unterschiede zwischen komplizierten und komplexen Systemen, Musterbildung, notwendige lange Lerngeschichte am Rand der Überforderung, die zur verlässlichen Intuition führen. Vor-Ort Experimente in Neu Delhi, Indien, Südafrika und Italien ermöglichten Slum- und Schulkindern den selbstbestimmten Zugriff auf das Internet. Die Lernergebnisse können die gegenwärtige Auffassung von Unterricht revolutionieren. Herkömmliche Resoucennutzungstrategien stehen dem natürlichen Lernen, der Potentialentfaltung, im Weg und vergrößern Probleme. BeGeisterung, GeSinnung und Ge(lassen)Haltung bilden Zukunft, indem sie in Kindern, Jugendlichen, Mitarbeitern SINNPotential entfalten. A series of real-life experiments in New Delhi, India, South Africa and Italy presented kids with self-supervised access to the Internet. The results could revolutionize the current teaching style. Explaining the Prisoner's dilemma: Cooperation and altruism fit into the larger evolutionary puzzle. Page generated in 2.972 seconds.